I recently played This is the Police 2 and though it was great. I enjoyed all the Police investigation style gameplay, mixed in with turn-based strategy missions. But then I picked up Phantom Doctrine (by CreativeForge Games), and a whole gulf in class became clear. 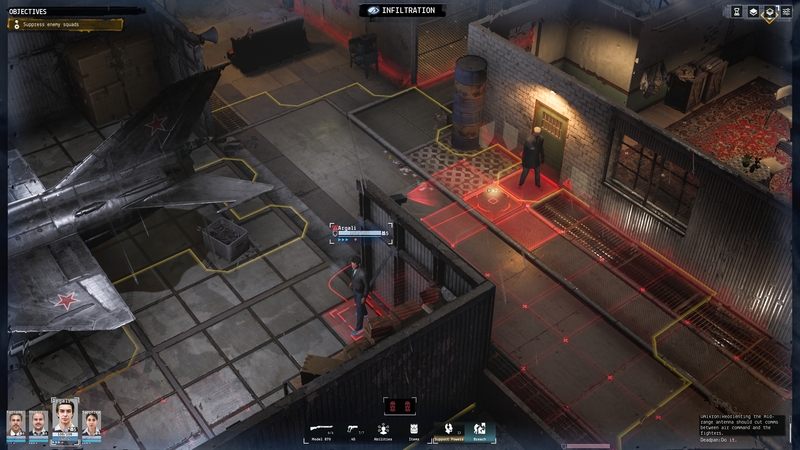 Phantom Doctrine is set during the Cold War era. With three campaigns to play; CIA, KGB, and Mossad, you will be in charge of a secret agent division. There’s a massive conspiracy theory to unravel during the course of the campaigns. But that is all I will tell you of the story. Phantom Doctrine is a lot closer to Xcom with its gameplay balance though. You start off with a handful of agents and the basic premises as a base. Throughout the campaign you will upgrade your base, hire more agents, train them, etc. One of the earliest unlocks will be the MK Ultra facility. This is where the game becomes super Cold War-esq. You can send Agents that you capture on missions, or even your own agents, in to the MK Ultra for a range of “treatments”. Again, you will unlock some of these treatments along the course of the campaign. But from Interrogation and Execution, to Brainwashing and convincing them to be a Saboteur, it’s all in there. How deep and dark do you want to go? It all costs money though. In the early stages of the game, you may need to reluctantly release agents. Only because you can’t afford the cleaning bill. Fortunately the base also comes with a forgery for making a bit of cash. You can also sell any of the equipment that you find in missions. So what are these missions? This is the turn-base element of Phantom Doctrine. And it’s where the game also swings back to being akin to This is the Police. Stealth is definitely an option, and often the preferred method. It’s a lot more tactical based espionage than kill all the bad guys. Maps will generally have a “restricted zone”. If your agents get spotted in here, then espionage mode will end and it’s time for combat. You have the option to send your agents on a surveillance mission before a tactical mission. If you do, the ability to send agents in under disguise becomes available in the tactical mission. This allows you get in those restricted zones, so long as you don’t get too close to an enemy agent. Usually you will have an enemy agent to kill or capture. Capturing is preferable as you can then glean some info out of them in the MK Ultra facility. There are also pieces of loot and secret documents hidden around the level. And these secret documents are what make up the second part of Phantom Doctrine. They all get fed into an investigation board, much like the ones in This is the Police 2. Only in a much more engaging way. Photographs or images, with already identified code words. With the redacted documents you need to open them up and click on the code words to identify them. Once you have several pieces of intel on the board, you will be able to tie together matching code words. 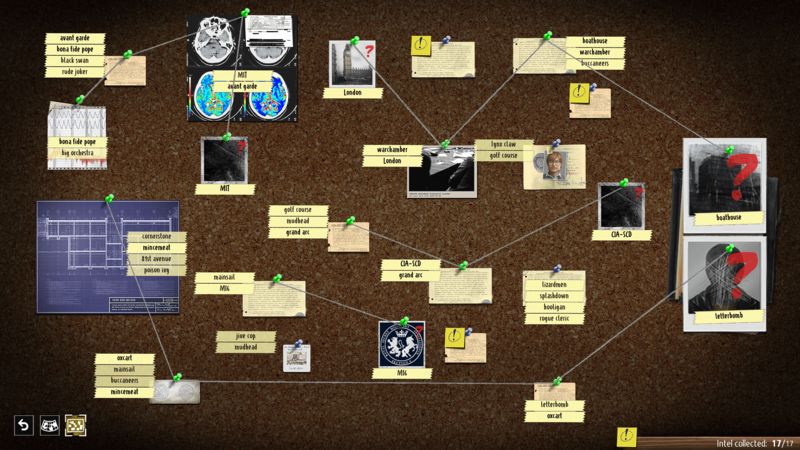 And slowly the web unwinds and you’ll uncover the person, place or organization you were trying to identify. It may be a little side feature of the game, but it’s done superbly. And over the course of a campaign that can take 40+ hours to complete, they break up the gameplay in a nice way. Phantom Doctrine is some grade A level covert spy work. Executed with precision and style. Not to mention the in-depth story plots of the campaign that I do not want to spoil for you. You’re just going to have to get the game to uncover those mysteries for yourself.